LET THE RIGHT ONE IN was one of the best films I saw in 2009. A beautiful, delicate, fragile little love story between two pre-teens in suburban Sweden - finding comfort in each other's company. He is the child of divorce, bullied at school, ignored by everyone else, deeply, violently frustrated and in search of emotional warmth. She is a little kid without friends, dragged from town to town, isolated, odd, and surprised to find a misfit she can relate to - someone her own age. The story had a sinister under-tone. She was a vampire, kept by an older man. But the presumption of paedophilia was over-turned - she was exploiting his weakness to satisfy her own craving for blood. It was this contrast - between her power over the older man and his twisted love for her - and the apparently more innocent but unreal relationship she had with the little boy - that made the film powerful. Its horror was emotional - rather than dependent on the old man murdering people to satisfy his young lover's blood-addiction. By contrast, Matt Reeves's (CLOVERFIELD) Hollywood remake is clumsy, garish and utterly without merit. At every possible moment, Reeves amps up the horror and gore at the expense of the delicate emotional story. The opening scene is straight from slasher-horror; the little girl is given the voice of Regan possessed in THE EXORICST, and CGI is used so clumsily as to give the murder-in-the-tunnel scene an unreal, almost comedic vibe that utterly took me out of the story. The only scenes that worked were the quiet scenes on the climbing frame that were shot for shot remakes of the original. 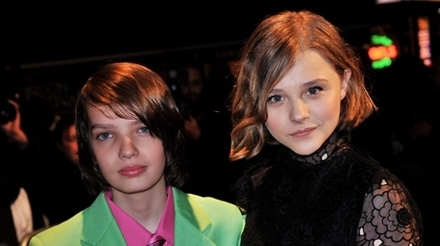 These scenes allowed Chloe Moretz and Kodi Smit-McPhee to shine in the central performances. But whenever Reeves' took the story in his own direction it became just another generic horror flick. Now, in fairness, I walked out of this film half an hour before the end because I was so disgusted with its dumbing down of the source material. That final half hour might have redeemed it. I doubt it. I should've listened to Bateman's prejudice about Hollywood remakes never adding anything to the original. I went in with an open mind, I assure you, but I was proved wrong. LET ME IN played Toronto 2010 and is currently on release in the US, Canada, Belgium, France and Australia. It opens in Spain next week and in the UK and the Netherlands on November 5th. It opens in New Zealand on December 2nd. agreed. always trust the flame-haired Oracle.